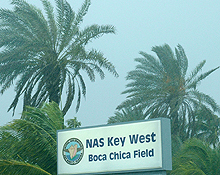 Naval Air Station Key West is located on Boca Chica Key, Florida. It is the second to last major island in the Florida Keys. Key West is the southernmost city in the continental United States. It is 1.5 miles wide and 4 miles long, it sits 93 miles north of Cuba, 153 miles southwest of Miami and 24.5 degrees above the equator. Emerald colored waters where the Gulf of Mexico and the Atlantic Ocean meet below the 42 bridges of the Overseas Highway make the three-hour drive between Miami and Key West especially beautiful.